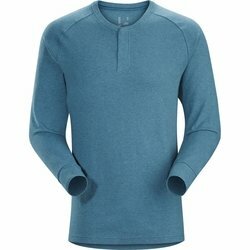 ARC'TERYX Sirrus LS Henley. A Henley with classic, natural style and comfortable technical performance, the Sirrus is great for easy weekends and daily wear around town. Made from DryTech, a smart cotton/polyester blend that pulls moisture off of the body for rapid evaporation, the Sirrus stays cool and dry on the move. The extended length, subtle textured face, and low-profile snap placket give it a versatile look that works on its own or layered under a flannel or over a crew neck.